105 Your word is a lamp for my feet, a light on my path. 106 I have taken an oath and confirmed it, that I will follow your righteous laws. 107 I have suffered much; preserve my life, Lord, according to your word. 108 Accept, Lord, the willing praise of my mouth, and teach me your laws. 109 Though I constantly take my life in my hands, I will not forget your law. 110 The wicked have set a snare for me, but I have not strayed from your precepts. 111 Your statutes are my heritage forever; they are the joy of my heart. 112 My heart is set on keeping your decrees to the very end. The Psalm is alphabetical. Eight stanzas commence with one letter, and then another eight with the next letter, and so the whole Psalm proceeds this way through the twenty-two letters of the Hebrew alphabet. One would contemplate that Psalm 119 was truly inspired by God. God’s law; this is enacted by Him as our Sovereign God. His way; this is the rule of God’s providence. His testimonies; they are solemnly declared to the world. His commandments; given with authority. His precepts; not left to be merely indifferent matters to us. His word,; it is the declaration of God’s mind. His judgments; framed through God’s infinite wisdom. His righteousness; it is the rule and standard of what is right. His statutes; they are always binding. His truth or faithfulness; it is eternal truth, it shall endure for ever. The word of God directs us in our work and way, and the world would be a dark place indeed without God’s direction. 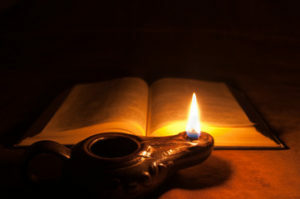 The commandment is a lamp kept burning with the oil of the Spirit, as a light to direct us in the choice of our way, and the steps we take in that way. The keeping of God’s commands here is that of a sinner under a gift of mercy, of a believer having a part in the covenant of grace. The psalmist is often troubled but desires to become more holy and offers up daily prayers for to bring grace more quickly upon himself. The message here is that we cannot offer any thing to God that he will accept except what God Himself is pleased to teach us to do. To have our soul or life continually in our hands, implies constant danger of life; yet the psalmist did not forget God’s promises nor his precepts. Numerous are the snares laid by the wicked; and happy is that servant of God (the psalmist), that the snares have not caused him to error from God’s precepts. Heavenly treasures are a heritage forever; all the saints accept them as such. Therefore we can be content with very little from this world. We must look for comfort only through the way of duty, and that duty must be done. A good man, by the grace of God, brings his heart to his work, then it is done well. Think about a caring friend – What are the attributes of that relationship that you enjoy the most? How would those attributes you shared compare with a relationship with our God? God’s Laws are always binding – Can you think of places where society is trying to redefine those laws? Where is today’s society indifferent to God’s Law? What advice do you think David is giving us when he says the wicked have set out “snares” for him but those snares have not caused him to stray from God’s Laws? God tells us that we can give Him nothing that matters except that which God Himself has guided us to give – How does one make sure our “work” in this world is God-led? The commission which Christ gave to the seventy disciples to preach the gospel, and to confirm it by miracles; and the full instructions he gave them how to manage themselves in the execution of their commissions, and great encouragement therein (v. 1-16). The report which the seventy disciples made to their Master of their success and Chris’s conversation with them (v. 17-24). Christ’s conversation with a lawyer concerning the way to heaven, and the instructions Christ gave him by a parable to look upon every one as his neighbor whom he had occasion to show kindness to, or receive kindness from (v. 25-37). Christ’s entertainment at Martha’s house, the disapproval He gave to her for her care about the world, and Christ’s praise of Mary for her care about her soul (v. 38-42). Jesus and his disciples went to Bethany village where Martha and Mary lived. Bethany was about two miles from Jerusalem. Martha invited them into her home. Martha lived there with her sister Mary. With such a large group of guests, Martha was very busy. To provide for them all, there was a lot of work to do. And Martha was anxious about it. Probably she would rather have listened to Jesus but she was too busy. But Mary did not help her in her work. Mary just sat at the feet of Jesus to listen to what he said. It seems that she was eager to learn from Jesus. And Jesus encouraged her to learn from him. This was not usual in those times. Not many Jewish teachers would teach a woman. It upset Martha that Mary did not help her in the work. It upset her that Jesus did not seem to care about it. She asked Jesus to tell Mary that she should come to help her. Jesus understood what Martha felt. He was gentle in his reply to her. Martha was anxious because she was so busy in her work for Jesus. Mary had not joined in that work, but she was still doing something good. Only one thing is really necessary for us: to receive a right relationship with God. Mary had done that and Jesus would not stop her. Our work for God should be the result of that relationship. We can be so busy that we fail to hear the Lord. It is better to hear the Lord first. Then we can do what is necessary. Where, within today’s church, do we see the attitude shown by Martha? Where does today’s busy lives short change our relationships with God? What seems to be the test for proper involvement in church life? From mankind’s perspective? From God’s perspective? Jesus excluded no one from becoming His pupil. Do you think that the church today is as open? Where are we successful? Where do we fall short? Martha, working hard for Christ, let herself become judgmental – How do we keep ourselves from letting this happen?